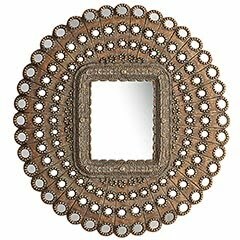 Currently stalking Pier 1's Honeycomb Mirror, which many of you have raved about and I have only lately come to appreciate - rustic yet glam yet global. It's on clearance for $199 (down from $250.) But remember when it was briefly on sale for, like, $90? Now I can't bring myself to spend $200. You may recall that this mirror invokes Wisteria's Peacock Mirror, which retails for a million dollars. See the honey in some rooms at A Blonde and a Brunette. Sixty dollars may seem exorbitant for a smallish piece of wood but not so much when a tree stump sells for $200 at West Elm (currently on sale for $160). A bigger root side table runs $180 plus at Pendleton. Viva Terra recently came back with their Root of the Earth stool for $150 plus additional shipping charges. Clever shopper I am, I hit 'refresh' for a few days hoping the price would drop a little. And then, of course, it sold out. you crack me up too! Love that Honeycomb mirror. I've used it on two jobs now. But, yea, I'm too cheap to buy it for myself. Ha-clever! I say go for that stump stool-that is a darling thing! I've seen a similar one(stool)pop up at HomeGoods perhaps a place to add to your stalking list. I breathe just a little faster every time I see that mirror. But I don't have a place for it... and yeah, $190. But it would be something you love, and you would see it everyday, daily....... isn't that worth $190? Hmm. Not sure. Ah, the danger of waiting for sales. I do the same thing! And it has burned me more than once. Ah, that mirror is one of my all-time favorites. One day... I saw Macy's had a more silvery version a while back but it was v pricey indeed... Good old Pier 1. Oh, I thought that mirror was the Wisteria one - the price doesn't seem so terrible, in that context. I would say, if you "stalk" something for more than a couple of weeks, that's a pretty strong buying sign. Just like TEO, I thought this was the Wisteria mirror. I have to say that if the resemblance holds up in person, I may have to just give up the $200. Love that stool too - I don't think my Kohls has that!